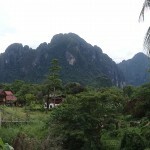 The journey here from Luang Prabang was a stunner. Lots of crazy twisting mountain roads with break taking views from the top. We arrived yesterday and have booked into a nice hotel for two nights as a treat. Its quite an odd little town. Very quiet and extremely undeveloped. Although tubing and pubs play re-runs of friends are still popular activities, Vang Vieng was far less of a vest-ival then I was expecting. It was actually quite nice. Not too much to do here but unbelievably pretty. Was so happy to find mango sticky rice on the menu’s too. Its so delicious! We have decided that washing our hair is no longer necessary. It was feeling rather straw like and starting to become troublesome. Will hopefully build up some natural oil and maybe even start cleaning itself. Its just a bit of an experiment really. Today is day 4, so we’ll see what happens.